Plot: Eleven-year-old Jonas lives in The Community with his parents and younger sister Lily. The Community is a utopian haven that’s embraced Sameness, a homogenization of the human race through genetic and social engineering. The process has yielded peaceful, long-lasting survival at the cost of rigorously regimented existence, absent of free will. Each nuclear family is allowed two children, one boy and one girl, produced by a designated birth mother and allotted to the family by a bureaucracy. After the children are grown, the family unit is dissolved, with parents proceeding to communal housing. A Committee of Elders governs The Community and watches over each child carefully, monitoring them and assigning them suitable careers. Jonas’ father works as a Nurturer, caring for newborns, and even bringing a child named Gabriel into the house for extra care because the baby cannot sleep soundly through the night. At the Ceremony Of Twelve, when all 11-year-olds come of age and receive their occupations for life, Jonas is assigned the highly honorable position of Receiver Of Memory for the community. He’s sequestered from the rest of the population and granted secret exceptions to The Community’s rules. Jonas’ mentor is The Giver, who proceeds to impart all his stored memories of pleasure, pain, and every emotion absent from The Community, so Jonas may know the truth of the world he lives in. Series status? Lowry has written two other novels set in the same futuristic era, with tenuously linked characters: Gathering Blue (2000) and Messenger (2004). The first direct sequel to The Giver, Son, will be published in October 2012. YA cliché? The Giver uses one of the most frequently employed plot structures for young-adult literature, a child on the cusp of maturity burdened with great responsibility. Jonas is the “chosen one” assigned to receive every stored memory, going back generations, and his acquired knowledge, shielded from all others, empowers him to spark the change that could lead to a release from monotony. Bad sign: For much of the novel, The Community is not an overtly dangerous or threatening setting. It’s a more science-fiction-influenced version of Stepford, or Spectre from Daniel Wallace’s Big Fish—an overly friendly town that feels unmistakably eerie, but seemingly devoid of malicious intent. Sameness has normalized the weather, human behavior, and the life cycle of every resident, which has the unfortunate side effect (however small) of rendering some stretches boring. It’s a credit to Lowry that she created such a banal community that readers yearn for the excitement that is later rewarded in Jonas’ training, but while she introduces the society in a compelling way, the fact that homogeneity and the status quo are The Community’s most sought-after characteristics limits any drama early on. Good sign: Jonas’ delight at receiving happy memories is infectious. One of the traits weeded out of The Community is the ability to see colors, and as Jonas sees flashes of the color in an apple while playing catch, or discovers his friend Fiona has red hair, his wonder is palpable. The dramatic irony of all that society has lost by removing variety undercuts Jonas’ overwhelming feelings of sensory discovery. As The Giver reveals more of his memories, the greater façade of The Community comes into focus, and Jonas is faced with the question of whether seemingly perpetual survival and protection from pain and suffering is worth the cost of nearly every valuable human emotion. Young-adult appropriate? At its core, The Giver is about the process by which young adults come into the knowledge of the harsh realities of the world and have to make sense of it. Children are often shielded from the truths of war and suffering, sometimes even physical pain. As Jonas receives memories from The Giver, he is exposed to glimpses of not only pain from injury, but also crippling hunger and the despair of war. On the other hand, he learns the joy of sledding in the snow, the warmth of sunlight, and familial love—something so drained from The Community that when Jonas asks his parents whether they love him, he’s informed “love” is a vague, meaningless word, inappropriate for expressing a functioning parent/child relationship. In striving for Sameness, The Community eliminates both extremes of human existence. As the idiom goes, there is no pleasure without pain, and Jonas’ journey depicts the triumph of diverse experience over mundane survival. The Giver’s great enduring success comes in part because it conveys this universal transition into adolescence with a great sense of importance, while also acknowledging that everyone is apprehensive about the unknown. Old-adult appropriate? The concept of Release is the most harrowing emotional disconnect bred into citizens of The Community. Jonas has been raised to believe that “releasing” a struggling child or elderly person means sending them to Elsewhere, a land never seen but assumed to be peacefully outside The Community—basically the “farm” where all those countless household pets were sent to so they could roam free. When Jonas discovers the truth, and sees his father’s participation in the deeply unsettling ritual, he is wrenched out of childhood innocence, and that experience is the impetus for Jonas’ escape with the baby Gabriel. Could use less: Implausible societal construction. 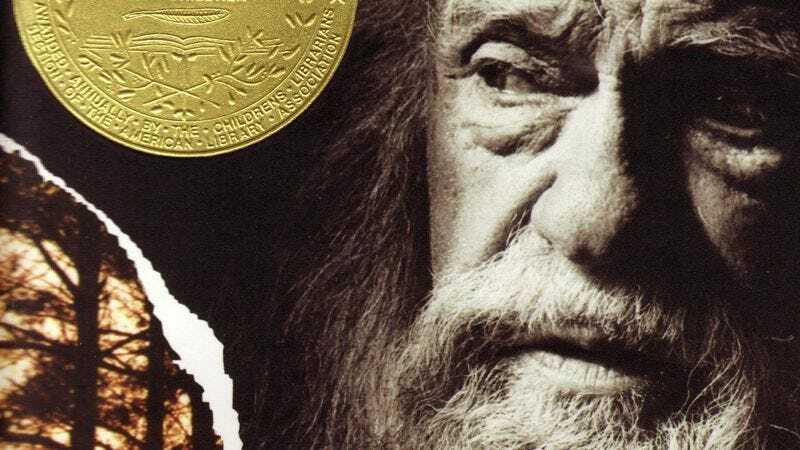 The Giver is intended for younger audiences, so the technical intricacies of The Community aren’t a focus, but even casually thinking about the logistics of the setting reveals some obvious flaws. Birthmothers only have three children and then become laborers, and each year sees another class of at least 50 children. Breaking down the numbers, at least 17 of the 25 girls each year have to be birthmothers, even though the profession is considered less than reputable. And that still leaves open the question of the jet that flies over the town and terrifies the citizens early in the novel, and The Giver’s revelation that the Committee considered shooting the plane down, which shows that Lowry didn’t exact have a meticulous plan in mind for how any communication across the world functions in this setting. But that’s just logistical nitpicking, since The Giver isn’t really about a community at large, or some kind of institutional conspiracy, or an oppressive society enslaving lowly citizens. It’s about Jonas coming of age and realizing along with The Giver that they can enact change that can restore true human feeling to a colorless, empty population. Could use more: Time to develop. After all the time setting up the world of The Community, the Ceremony Of Twelve, and The Giver, the final third of the book rushes to bring Jonas to the level where he’s capable of executing a final escape. Since the memory-transfer sequences are among the most mesmerizing in the book, the way Lowry skips through the first year of Jonas’ training allows barely enough time to understand how much Jonas has learned and how different he is from the others in his year. And the stampede to the finish robs The Giver of some potentially gorgeous subtlety as it fills in just how much life has been drained from The Community. For fans of: Stories of crowd psychology (a frequent Twilight Zone theme) or dystopian literature before The Hunger Games made a Battle Royale infusion almost mandatory. The Giver is more like a version of Fahrenheit 451 for children, a stepping-stone to Ray Bradbury’s more sinister tale, which has a similar desperate-escape finale, but a much less ambiguous ending. The Giver comes from what seems to be a lost tradition in dystopian storytelling. It used to be okay for genetics to eventually yield an individual who wants to break free from societal homogeny, and choose to escape that oppression to a safer community. Now, merely escaping isn’t enough—dystopian-thriller protagonists must learn brutally militaristic tactics and enact violence that brings tyranny crumbling down in increasingly bloody action sequences. The Giver isn’t a story about The Community or the world, but about how one person growing into adulthood can enact personal change with greater ramifications.